This year the show was in our back yard, which is great if you forget your business cards or a shoe – which we didn’t – and, you could run into a librarian from your former high school – which we did! That was fun. 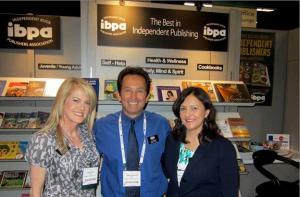 IBPA has been attending ALA for 20+ years now, so we usually land a pretty good location on the show floor. This year we were in the perfect spot between Scholastic and Penguin Books, so the traffic was steady and constant. The mood for the show was decidedly “excited and interested” and the IBPA booth was full of visitors. The exception was during well-attended classes after which we would get the overflow groups, eager to get back out onto the show floor. This is to be expected, as the ALA show is the librarians’ annual conference, which includes their own seminars, author breakfasts, and other programs. And, we certainly enjoyed representing our members’ titles this year. Booth signs proclaiming “IBPA—The Best in Independent Publishing” and posters announcing that” Independent Publishers Rock” and “Support Independent Publishing” were attention-getting and had the desired effect—to attract visitors into the booth. Again this year, we offered postcards and bookmarks—they were hot, hot, hot! The ALA show is primarily an information gathering show and librarians are the ultimate information gatherers. Some librarians are very specific in their needs and we follow them with catalog in hand, circling requests. Others stand in a certain genre for a period of time, make a detailed list and move on with precision. The great thing about librarians is that they will walk right into the booth and start “shopping,” because librarians are genuinely interested in the product from independent publishers. Year after year, librarians come to the IBPA booth to see our display and to tell us that they appreciate the IBPA mailings as well. As a point of information, we took a straw poll at the Public Library Show (PLA) as to whether librarians preferred print or email to receive their information. The result was two to one in favor of print! Specific interests voiced this year were in Children’s and Young Adult titles, History and Historical Fiction and Science, although the entire stand received well-deserved attention. We had a beautiful color catalog this year that we handed out to so many librarians. For those who didn’t want to carry one more thing, we took names to send it to them after the show. We will also send the PDF of the catalog to the entire list of librarians we collected at the show. Orders usually take place as a library’s fiscal year ends which is when they get their dollar allocation for the year. Many of you can expect to see orders through your listed wholesaler or distributor (or website) over the next 6-7 months. We gathered seven hundred plus contact names of librarians from all over the U.S. who specifically left their information at the IBPA booth and exhibiting members can receive a copy of that list upon request. We also had some wonderful members visit the booth this year. Thank you to everyone who came to the booth to visit and lend a hand. We really appreciate your enthusiasm and support! The books in the booth were donated to the ALA’s charity benefiting literacy. If you have any specific questions about the display or the ALA conference, please feel free to contact the IBPA office. We are happy to help. Thanks to the members who participated and supported IBPA.